It’s Chinese Lunar New Year and the above traditional greeting means “Wishing you lots of prosperity and good fortune!” This festive period lasts for 15 days during which there’s much celebration especially in vibrant and colourful Chinatown. The following reflects some of the cultural customs and practices. 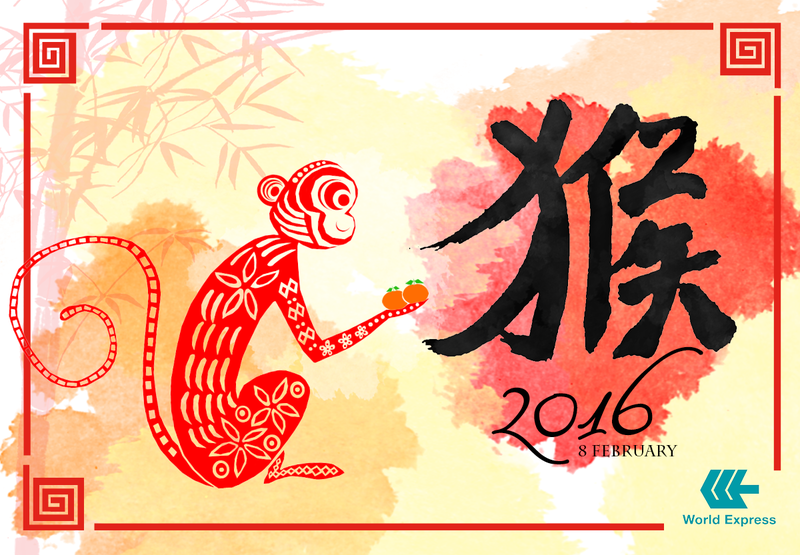 According to the Chinese Zodiac, 2016 is the Year of the Monkey which begins on FEB 8. What are its traits? Born in the Monkey years – 1932, 1944, 1956, 1968, 1980, 1992, 2004, 2016 – these people are supposedly clever, flexible, highly inventive and a born problem solver but can be quite eccentric and feel they are always right. Monkeys are said to be compatible with those born in the years of Ox and Rabbit with whom they can be partners and friends. Some famous Monkeys: Leonardo da Vinci, Charles Dickens, Oskar Schindler, Diana Ross, Elizabeth Taylor, Paul Gauguin and Yao Ming. The Year of the Monkey is said to be a time of innovation and advancement – a lively, optimistic and progressive year where finances, politics and real estate should see an upturn. The monkey brings many new and unconventional ways of doing things. Chinese New Year calls for much preparation as each household gets the traditional delicacies ready such as Mandarin oranges, Chinese sausages, melon seeds and love–letters. On the big day, FEB 8 – each family donned in new clothes, goes visiting relatives and friends. It is customary for the younger generation to pay their respects to their elders. Mandarin oranges representing “gold” are exchanged for luck, and red packets or “ang pows” containing money are given to children, unmarried relatives and household help. Dollars are usually given in even numbers as odd numbers are considered unlucky. There are many traditional taboos and customs to remember if one is to safeguard against losing one’s good fortune! Red is an auspicious colour to wear or display; brooms are hidden from sight lest they sweep out the luck, and no lending or borrowing of money should take place at this time. Chinatown Street Light-Up (Jan 16–Mar 8) – Chinatown dresses up for Year of the Monkey and came alight on Jan 16 with peach trees lining up the street of Chinatown and decorated with lovely monkeys hanging around. Enjoy a plethora of activities such as thrilling dragon & lion dance performances, the festive night markets where visitors can feast on a variety of local New Year delicacies – pineapple tarts, love–letters and barbeque pork. River Hongbao 2016 (Feb 6–14) – this annual carnival at The Float @ Marina Bay is special this year as visitors will be treated to 9 consecutive nights of fireworks display at 9 pm. The event offers a wonderland of culture, food, lights and entertainment amid a cacophony of sights and sounds. In line with the Year of the Monkey, the decoration and performances will include elements of Journey to the West, a classic Chinese story featuring the Monkey God. It is an integral part of Singapore’s CNY celebrations attracting local and tourists to come forth and immerse themselves in the festive atmosphere which is open to the public with free admission. Chingay Parade (Feb 19 & 20 @ 8:00 pm @ PIT Building, next to Singapore Flyer) – this is an annual street procession to mark Chinese New Year and is celebrated by all races. Acknowledged as a world-class parade in Asia, Chingay procession is a vivid celebration of Singapore’s multi-cultural richness. There are local and international performances, dazzling pyrotechnics, dancing dragons, prancing lions, stilt walkers and vibrant floats – to inspire harmony, joy and dynamism! Now that you have an idea of what’s happening during Chinese New Year, do join in the auspicious celebrations and usher in a bountiful Year of the Monkey. May all your endeavours bloom and flourish!